Gerald G. Vairo, 77, of Bootjack Road, Lake Linden passed away peacefully in his home surrounded by family and loved ones on September 8, 2017. Gerald was born on August 2, 1940 in Laurium, the son of Dominic and Dorothy (Ahrbeck) Vairo. He graduated from Calumet High School with the class of 1958 where he was considered an outstanding student, leader and athlete, excelling in football and basketball. After graduation he attended the University of Notre Dame receiving a BA in Political Science in 1962 and a Juris Doctorate in 1964. On August 24, 1963 he was united in marriage to Claudette Dion at St. Joseph Church of Lake Linden. In 1965 he began his law career with the law firm of Messner & Labine in Houghton. Later he became the senior member and partner of the law firm of Vairo, Mechlin, Tomasi, Johnson and Manchester for 50 years with offices in Houghton and Calumet. He spent his career supporting and helping the community he so loved. Jerry’s first priority was family. He was a person that valued integrity and found his greatest fulfillment in helping others. He faithfully read the sports page to follow the latest news about Calumet High School, Notre Dame, Green Bay Packers and his New York Yankees. He was always interested in encouraging and supporting the academic and athletic pursuits of the youth in the community, especially children and grandchildren of relatives and friends. He also loved to watch things grow. With the help of family, friends and neighbors, he was able to have vegetable and flower gardens to enjoy, especially his roses. He was a member of the State Bar of Michigan, the Michigan Council of School Attorneys, the American Bar Association, past president of the Copper Country Bar Association, and an arbitrator and member of the American Arbitration Association. He was a past member of the Board of Directors and Board of trustees of the Michigan Catholic Conference. He served on many local boards and organizations that supported our community, which included the Board of Calumet Electronics Corporation from the time of its inception in 1968. He also served on the board of Merchants and Miners Bank, First of America Bank, National City Bank and River Valley State Bank. He was a past member and Director of the St. Joseph-Portage View Hospital for over 20 years. Jerry was proud of the work that he and others did to help save sports and extracurricular programs in the Calumet School district and was a founding member of the Calumet All Sports Booster Club as well as serving as its first president. He served as Director and President of the CLK Foundation, and was a member of the committee for the restoration of the Agassiz Field. He was responsible for organizing the restoration of the George Gipp Memorial. In addition, he was a faithful parishioner of St. Paul’s the Apostle Church serving as a church lector and committee member for the restoration of the beautiful stain glass windows. He received the Russell Erkkila Community Service Award, the Copper Country Association of School Board’s Service Award, and the All-Sports Booster Club Certificate of Appreciation. 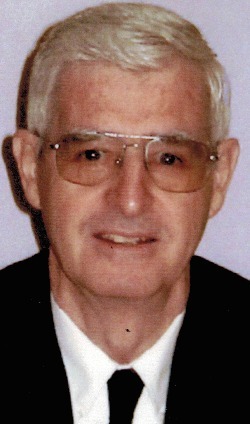 He was elected to the Calumet High School Athletic Hall of Fame, and in 2015 was awarded the Distinguished Alumni Award by the Calumet High School – Sacred Heart High School Reunion Association, Inc.
Gerald is survived by his wife Claudette, his children, Julie (Mike) Milani of Hinsdale, IL, Nicole (John) Brisson of Glen Ellyn, IL, Gina (Patrick) Flynn of University Heights, OH and Stephen (Shannon) Vairo of Houghton, MI, his grandchildren Tim and Katie Milani, Dominic and Sophie Brisson, Thomas and John Flynn and Gerald J. Vairo, and his sister, Dr. Judith Best of Ithaca, NY, as well as many nieces and nephews. He was preceded in death by his parents, Dominic and Dorothy and his grandson Anthony. The family would like to thank Dr. Luoma and the staff of the Aspirus Keweenaw Hospital for the professional care they gave Jerry on his numerous visits to the various departments over the years. Also, thank you to the staff of Aspirus Home Nursing, Home Services, the Bootjack First Responders and most recently Aspirus Hospice Comfort Care. A special thank you to his great caregivers Brenda, Beth, Roger, Mary and Jenna whom were all supportive both professionally and spiritually to Jerry and his family. A Mass of Christian Burial will be celebrated at 11:00 a.m. on Saturday, September 16, 2017, at St. Paul the Apostle Church in Calumet with Fr. Abraham Mupparathara as main celebrant, Fr. Corbin Eddy as concelebrant with Deacon Art Stancher assisting. Friends may call on Friday, September 15, 2017 from 3:00 p.m. until 8:30 p.m. at the Erickson Crowley Peterson Funeral Home, 26090 Pine Street, Calumet. A prayer service will be held at the funeral home at 8:00 p.m. In lieu of flowers, memorial gifts can be given to The Dominic Vairo Scholarship Fund, 57070 Mine Street, Calumet, MI 49913, The CLK All Sports Booster Club, P.O. Box 295, Calumet, MI 49913 , St. Paul the Apostle Church 308 Eighth Street Calumet, MI 49913, or a charity of your choice. To send flowers to the family of Gerald George Vairo, please visit our Heartfelt Sympathies Store.